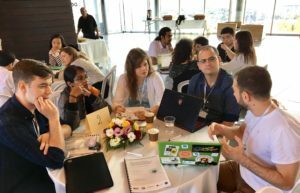 Each professor identified 7 students – an equal number of women and men – to attend the workshop in Tel Aviv in October 2017 to work outside the traditional academic model of inquiry and research. The art of collaboration and an open philosophy about innovation were at the heart of the workshop. From an array of cultures, backgrounds and disciplines, students were assigned to a cohort made up of students from other universities whose areas of study were vastly different from one another. Even room assignments were made to bring together students from different institutions. 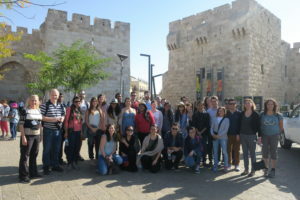 In addition to the intense rigors of the workshop, Tel Aviv University arranged social activities including a scavenger hunt through Jaffa, a pizza party and a day-long tour of Jerusalem and the Dead Sea. Within a few short days, students who had never met before were deeply bonded academically and socially as future friends and colleagues. Teams selected their own topics that tackled universal challenges such as Alzheimer’s, mapping emotions and speech disorders. What does the future hold for Broadcom Foundation’s University Student Workshops? More exciting workshops! In 2018, the KKT Workshop will be hosted by KAIST in Korea, the Asia Pacific Workshop will be hosted by the University of California, Irvine in Pasadena, California and the EMEA Workshop rotates into London where it will be hosted by Imperial College. Watch highlights from the EMEA Workshop at https://youtu.be/ems3fXkSFIQ.